Beschreibt eine Methode für das MVVM-Entwurfsmuster, um eine View von einem View­Model aus mit Befehlen zu steuern. In WPF-Anwendung nach dem MVVM-Entwurfsmuster ist es nicht gerade einfach, die View von einer View­Model-Klasse aus zu steuern. Theoretisch sollte das gar nicht möglich sein. Aber wie du weißt geht das in der Praxis nicht immer so. Ähnlich zum Command-Muster, mit dem eine View ihr ViewModel steuert, schlage ich das ViewCommand-Muster vor, das in die umgekehrte Richtung wirkt während es die lose Kopplung von View und ViewModel erhält. This article was first published in March 2013 on CodeProject. 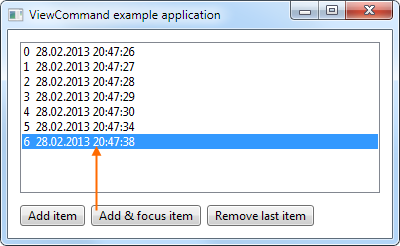 Sometime during 2013, it was extended to address ViewCommand methods by a separate name given in the attribute. The article was then copied to my site and updated in February 2014. Notes about the new nameof operator in C# 6 were added in May 2016. The Model-View-ViewModel (MVVM) design pattern is a great way to separate concerns of UI and business logic in WPF applications. It is based on the general principle that the View layer defines and handles anything UI-related while the ViewModel layer implements the business logic and prepares model data to be used in a view. This makes the view replaceable, for example by a dummy when running test cases on the application to verify the business logic implementation. For this to work, the ViewModel must not know anything about the View it is presented in. There could even be multiple views presenting the same ViewModel or parts of it at the same time. Conversely that means that the ViewModel cannot control the view in any way. It merely provides the data for displaying, notifies on changes, and accepts any changed data for validation and processing. Now sometimes when data is modified from a ViewModel class, it is advisable to somehow influence its presentation beyond the capabilities of style data binding. A colour highlighting can be provided through a property that a style can bind to. The visibility of some UI parts can also be controlled through such a property. But if a new item is added to a list, it should be made visible by scrolling to its position. If a new text input becomes visible, it should be focused so that the user can continue typing right away. All of these actions are not states that could be represented by a state variable, but rather like events that are raised in the view. One-time actions, not time-span states. While some suggest using a state variable for such tasks and reacting on changing their value, this solution has the issue that nobody will reset the state when it no longer matches reality; and when coming back to the View, it will still be set and perform that action again. This is where the ViewCommand pattern comes in. Much like the Command mechanism used to perform actions in the ViewModel initiated by the View, it can be used to perform actions in the View initiated by the ViewModel. // This is already there. Nothing to change here. In this example, TextItemView is the view that displays an item of something with a text input control. // we could’t decide on one of the return values we’d get. ﻿// Implement the IViewCommandSource interface. // The data property used in the XAML binding above. Now everything is set up to use the whole ViewCommand thing. Finally, calling a command on a view can be done through the ViewCommandManager.Invoke method. Just pass it the name of the command as first argument (you can use C# 6’s nameof operator, see below) and it will try its best to call the command method on every registered view instance. Just like the Command pattern uses data binding to fetch the command object from the data context, which in turn uses reflection to look up the property, this class also uses reflection to find the command method in the view class. So there’s no additional connection setup required. Just add the methods in the view and call them through the ViewCommandManager class. Here’s an example (spot the bug! ), this time from a parent ViewModel that is managing a collection of TextItemViewModels. But... this still contains a major issue. Did you find it? The OnAddText method just created a new instance of the ViewModel and added it to an ObservableCollection<TextItemViewModel> for the parent view to pick it up and display it in some ItemsControl. A template directs it to use our TextItemView control for each instance in the list. So as soon as the new item is added to the collection, a new view instance will be created and assigned the respective ViewModel instance. But this is also done on the UI thread and only after the thread is free from the OnAddText method. This means that at the time the new ViewModel is added to the collection, the view may not yet exist and thus newVM isn’t assigned as its DataContext yet and consequently the view isn’t registered with the ViewModel yet. Invoking a command now would not do anything because there is no view registered. In other situations where the addressed view already exists, using the normal (synchronous) Invoke method is perfectly fine though. Also note that if you use the same ViewModel instance in multiple Views, doing something like setting the UI focus won’t work correctly because the second view will steal the focus from the first one. Other actions like scrolling a list or starting an animation will work on every registered view. The implementation of the ViewCommand pattern is actually pretty simple. It’s contained in the file ViewCommand.cs in the sample application and consists of three types. First, and most important, is the ViewCommandManager class. It provides static methods for the DependencyProperty metadata overriding. This allows to monitor changes to the DataContext property which means that another ViewModel instance is now presented by the view. This uses the next group of members in the ViewCommandManager class: RegisterView and DeregisterView. Obviously a ViewModel should only be able to control the views that are currently displaying them. This, by the way, makes a notable difference to the MVVM Light Messenger class that was also suggested as a solution to the above described focusing problem. A ViewModel can simply issue a command, and the ViewCommandManager will automatically find the currently connected views from the list it keeps. Last is the Invoke methods, that actually send the command to the views. You can also pass any number of arguments to the Invoke methods, but you must ensure that number and types match the ViewCommand method in the View class. Optional parameters are supported as well: just leave them away for Invoke. Also in this file is the interface IViewCommandSource that makes ViewModel classes recognisable by the automatic registration (only ViewModel classes implementing this interface can be registered and thus send ViewCommands anywhere), and the ViewCommandAttribute class that is used to mark ViewCommand methods in the View class. This attribute is used to ensure that only those methods in a view can be called through this mechanism that are explicitly declared as such. Worth mentioning is that the ViewCommandManager class keeps weak references to the registered views. This means that no hard reference to the views is held, which could lead to memory leaks if views are unloaded from the UI and not used anymore, but would still be kept referenced from a ViewModel as connected View. Those views can be garbage-collected and free their memory without the need to explicitly deregister from their ViewModel on unloading. Views that no longer exist will simply be skipped when invoking a command in views. Since the ViewCommandManager property in a ViewModel is public, it can be accessed from other ViewModels in the hierarchy like regular data properties. Just like in the example above, the parent ViewModel that creates a new sub-ViewModel can invoke a ViewCommand on that child instance. Just like normal Data Binding will generate a Trace message when it cannot find a property, the Invoke method could also do this to help the developer finding problems with the used commands. Two types of errors could be detected: Either when the requested command method is not found in the View class, or when no views are currently registered at all. The latter may be the case when trying to invoke a ViewCommand on a view that wasn’t created yet. Because of the use of reflection and no type-binding to the View class, you won’t get any IntelliSense support when selecting a ViewCommand. Code refactoring will also ignore the method names where you call them. But none of these points make a difference to the DataBinding that is already used in WPF and XAML. Update for C# 6: One of the cool new features of the C# language version 6, available from Visual Studio 2015, is the nameof operator. This allows you to specify a reference to a class or member that is understood by the compiler and IDE and have it resolved to its name as a string during compilation. Instead of Invoke("MyCommand") you can write Invoke(nameof(View.MyCommand)). This will be considered when renaming the method and it allows going to the method definition in the editor. If you apply code obfuscation to protect your code in closed-source applications, you must exclude the ViewCommand methods from renaming or they cannot be found at runtime. (The ViewCommandAttribute may help you in specifying the affected methods.) Alternatively, you can specify a name for the View class method with the ViewCommandAttribute which helps the ViewCommandManager finding the requested method if it was renamed. You could also use this mechanism to assign arbitrary ViewCommand names and keep them as string constants in a separate class in your application. The ViewCommandManager instance methods are not threadsafe. They will also not perform any cross-thread marshalling of commands to the UI thread. Should this be necessary (does anybody use ViewModels in separate threads? ), appropriate locking and dispatching would need to be implemented. Diese Software wird unter den Bedingungen der MIT-Lizenz veröffentlicht. Die genauen Lizenzbedingungen befinden sich im Download. Erstellt am 2014-02-01, aktualisiert am 2016-05-20. ViewModelBase-Klassec#classreflectionwpfBasisklasse für ViewModels nach dem MVVM-Muster, mit einigen Vereinfachungen für abgeleitete Klassen. ViewModelKit.Fodyc#classwpfMakes WPF ViewModel classes smart by default. Implements INotifyPropertyChanged and DelegateCommands for auto properties, recognises dependent properties, connects property changed handlers.